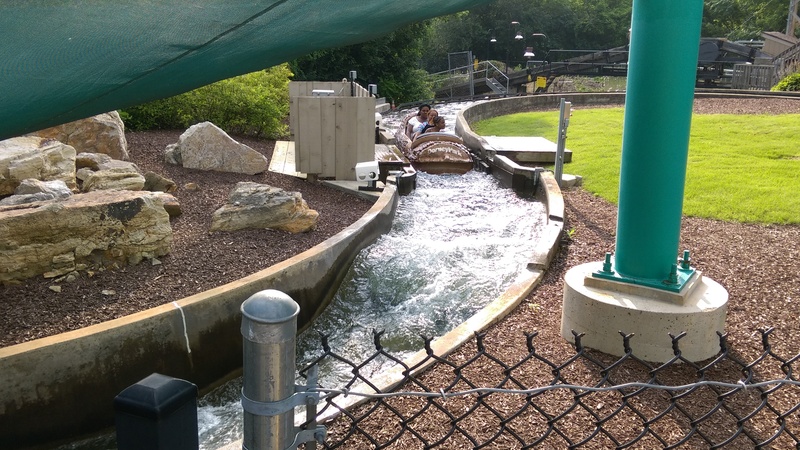 Barr Engineering first got involved in the amusement park history in 1978 when they were hired by Valleyfair (Shakopee, MN) to design and manufacture a new log flume for the park. This popular attraction was removed in 2008 to expand the waterpark, Soak City. 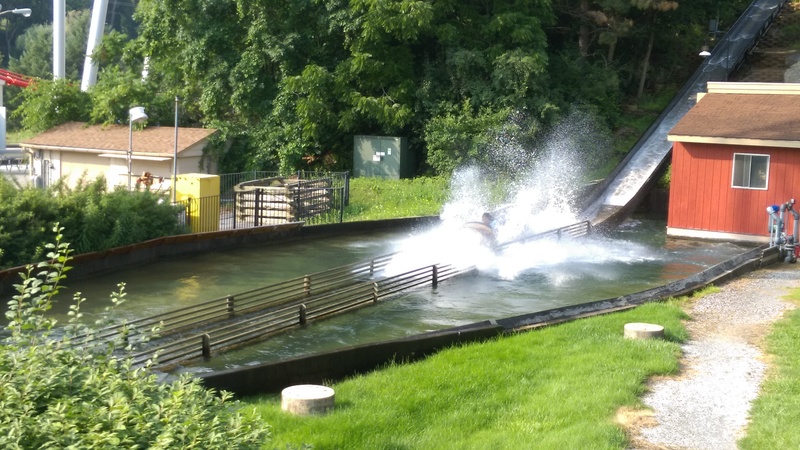 In 1981, they transformed the old Jim Owens Float Trip into the American Plunge log flume. 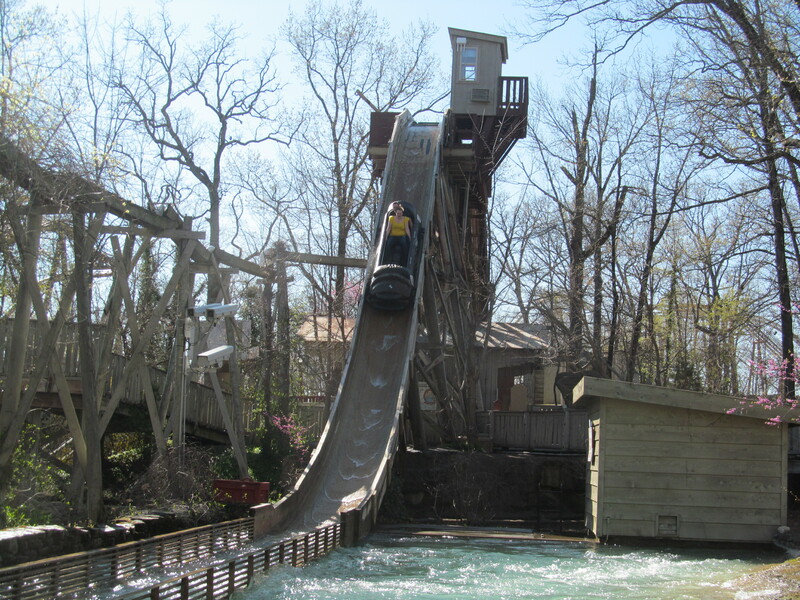 Located at Silver Dollar City in Branson, MO, Jim Owens Float Trip took riders aboard small boats past various humorous scenes such as a tumbling outhouse, a dark cave and through whirlpools. Barr designed a new course that reused some of the existing theming and followed the storyline of riders being daredevils racing to the top of the steepest falls around. Large 6 passenger boats are used and a double station similar to older Arrow log flumes is used the eager daredevils. A steep 50 feet drop is our goal and unlike many manufacturers, the running rails at the bottom of the drop do not raise the boats out of the water. The result is a large splash. 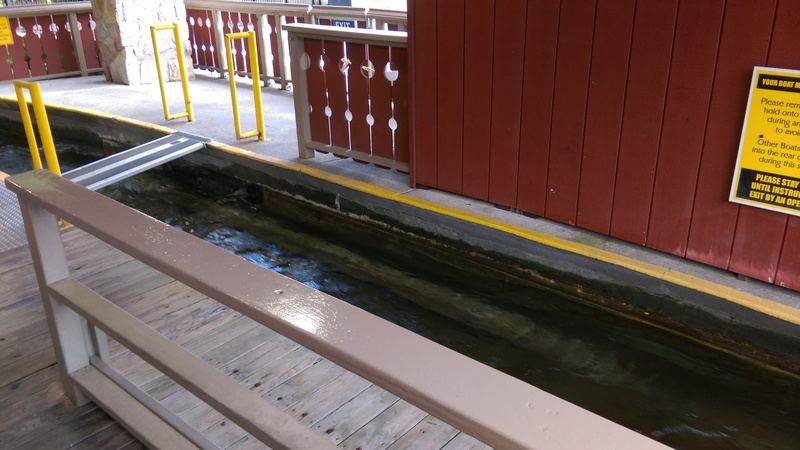 Notice that the runout of the drop goes directly into the water. 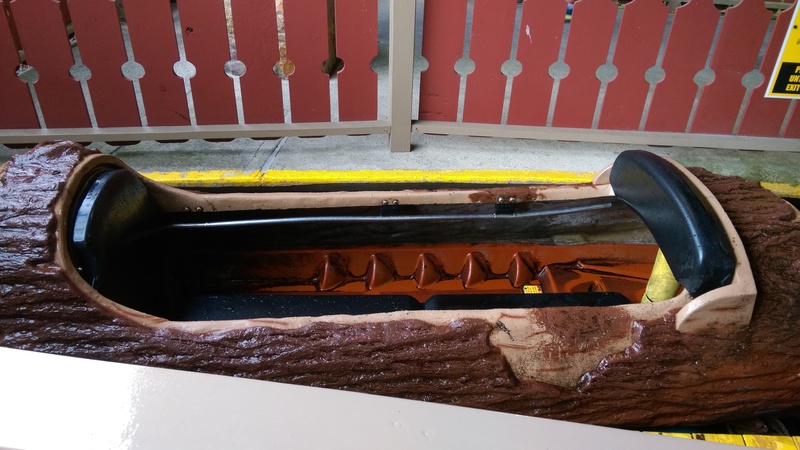 The lift hill use square anti rollback blocks to prevent the boats from slipping backward in case of a ride stoppage. 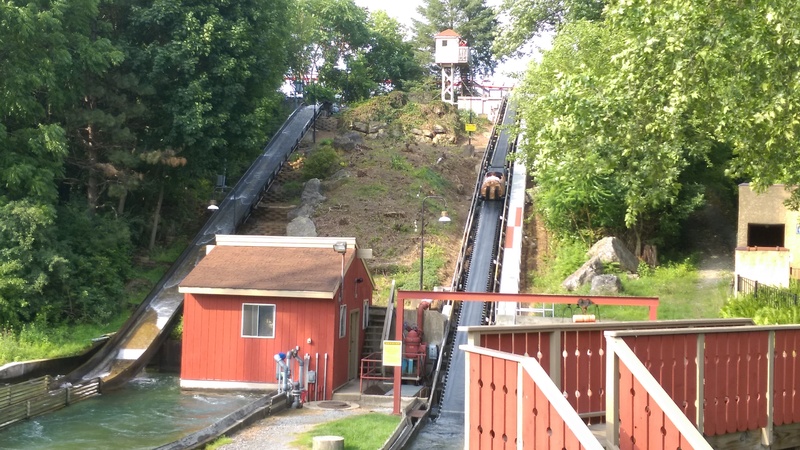 In 1982, Barr Engineering designed Thunder Creek Mountain at Dorney Park (Allentown, PA). What is remarkable about this attraction is the unique split lift where halfway through, it changes angle to align with the top of the course. Most of the course is on top of a hill and it uses supports only when the cement trough goes under the lift hill. From the Hydra: The Revenge roller coaster exit, you can see the cement trough. When the boat aligns with the yellow grab rails, it is stopped so riders can board. One of the log used on Thunder Creek Mountain. The drop down the hillside is 210 feet long and is one of the longest on any flume in the world today. A boat is going up the lift hill. Notice the long drop on the left. Like American Plunge, the boat goes directly into the water and creates a huge splash. Sky Trans Manufacturing was originally an offshoot of O.D. Hopkins that was formed in 2002 to handle the ropeway and chairlift business. Eventually, they got back to water rides and manufactured a few attractions. One of those is the Gator Falls at Tampa, FL Lowry Park Zoo. It features an aerial course with the boats floating high in the air. Then, as a unique feature, the typical Hopkins rubber belt before the drop was moved before a turn. The boat then rolls around a dry turn, picks up speed and then goes down the 30 feet drop. At a cost of only 1.5 million dollars to build in 2008, it was a very cost effective attraction for the park. 6 boats were originally used on the attraction. 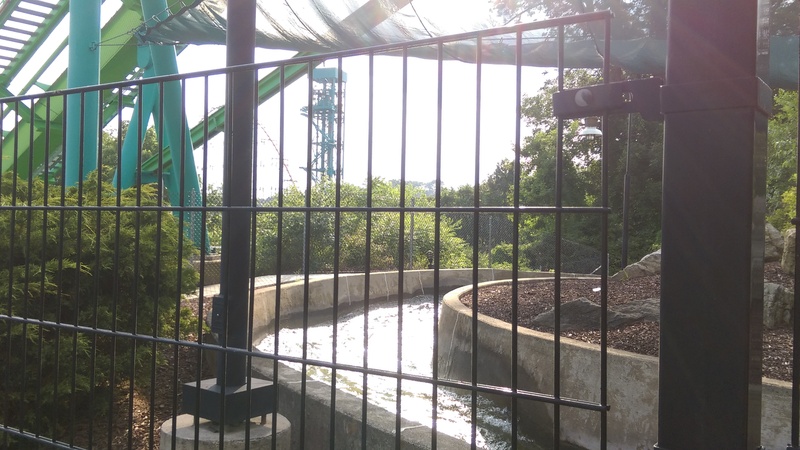 This entry was posted in Water Ride and tagged American Plunge, barr engineering, Dorney Park, log flume, Silver Dollar City, Sky Trans Manufacturing, Thunder Creek Mountain, Valleyfair, water ride. Bookmark the permalink.